Due to the aggressive use of social media during the 2008 US presidential elections, Barack Obama’s campaign is considered one of the most successful in history. Web 2.0 tools, such as YouTube, Facebook, and MySpace, were employed extensively by the Obama campaign to raise funds as well as to target, organize, and mobilize voters. As a testament to the campaign’s success, candidates in the US and around the globe began to embrace social media. However, it is unclear how candidates, parties, and citizens are using Web 2.0 tools in campaigning and to what effect these tools have on citizens’ political attitudes and behaviors. Drawing on the recent literature, this chapter aims to examine how citizens and candidates in the US and abroad use various types of Web 2.0 applications, particularly YouTube, Facebook, MySpace, and Twitter, during election campaigns. The causal influence of Web 2.0 tools on citizens’ political knowledge, government cynicism, and participation is also discussed. 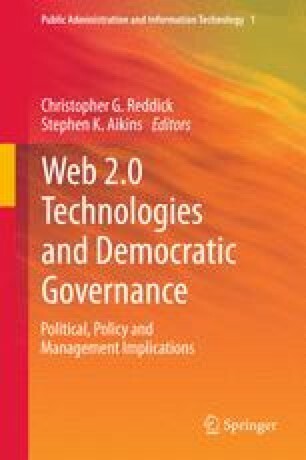 Finally, the implications of Web 2.0 technologies for democratic discourse are summarized, such as their potential to revolutionize campaign communications and the dissemination of political information. Internet World Stats. (2011). World Internet usage and population statistics. Retrieved from http://www.internetworldstats.com/stats.htm.